Small - $44.99 Medium - $24.99 Large - $29.99 X-Large - $44.99 Only 9 left! Oh, she's a baddie. You always knew it from the day she was born, but as she grew up, your entire family learned all about how cool she was too. But when she took the stage, that's when everyone found out her true skills: that she's a Skeleton Rocker! She shredded the guitar, and her stage presence was amazing. But, really, would we expect anything less from her? 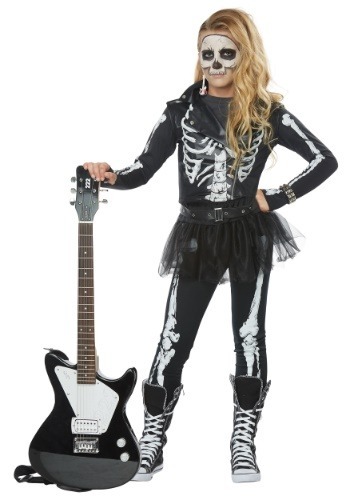 After all, she’s got the Skeleton Rocker costume, and she’s ready to conquer Halloween. And launch a world arena tour! Yes, fame will be the only course for her when you set her up with this special Halloween costume. Her first step for her will be to rock the big concert at the graveyard. After a few of those, we're sure she'll work her way up to performing in stadiums. And when she hits the recording studio, we're sure her first album is going to be a smash hit. Yeah, we knew she had it in her!! And so did you, which is why you got this totally sweet girl's costume. Cool vinyl vest style and a little tutu glam make this costume a big time upgrade from your normal skeleton jumpsuit. And if you complete the look with makeup or a fearsome mask (sold separately) she'll have the most frightening look we've ever seen on a rocker. Just remember to give us credit for hooking you up with this costume. Because it will be the thing that really let her become a star!